Nelson’s chicken can’t be purchased in a restaurant. You have to find an organization holding a fundraiser. 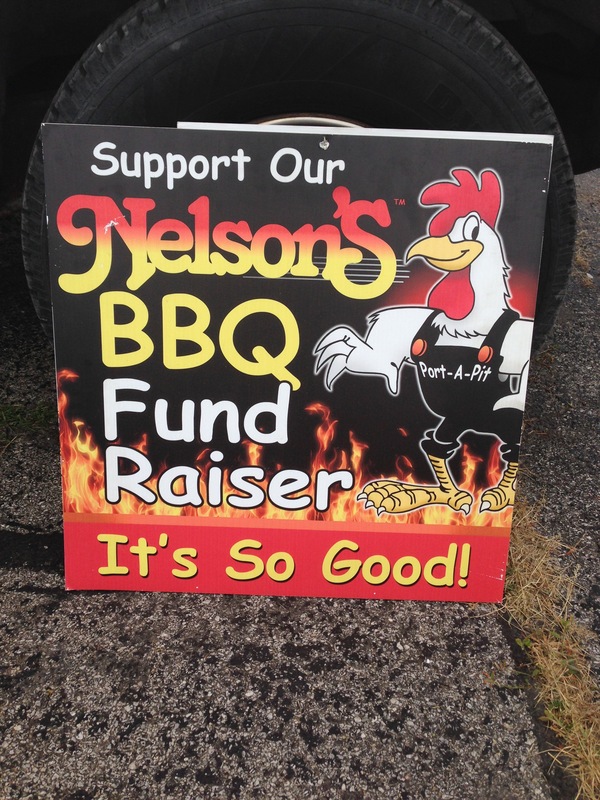 We spend a week at the lakes around the 4th of July and are usually always lucky enough to hit a fundraiser selling Nelsons Chicken (and roasted “Pit Potatoes”) it’s kind of a family traditions for us … a delicious one. 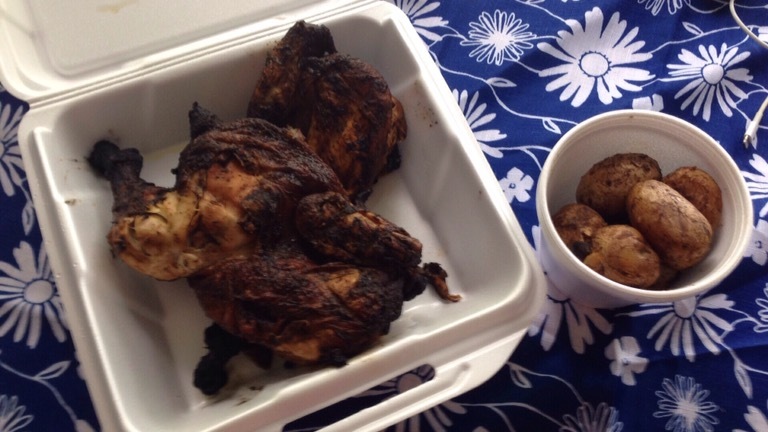 We had some friends joining us this weekend and we picked up 6 orders of chicken and 4 potatoes. You get a half a chicken with an order. The line for this always runs 1/2 a block long. No different today. 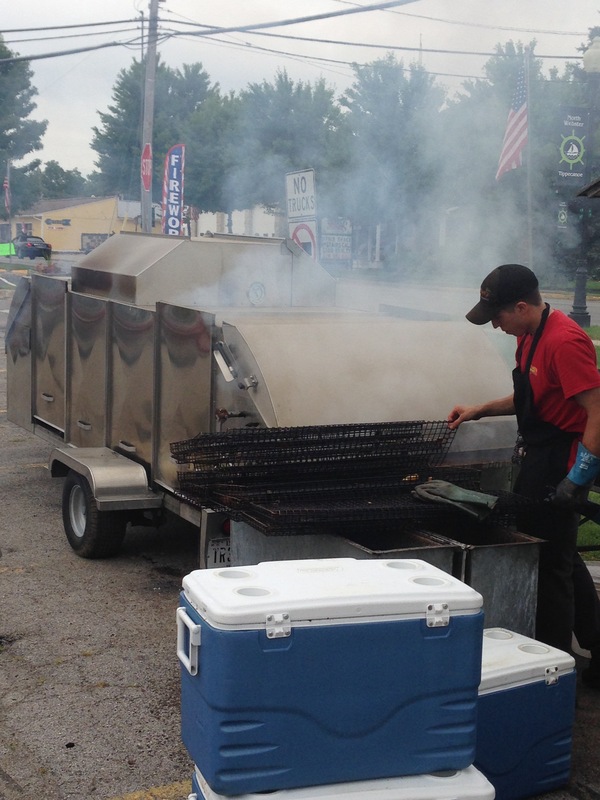 The local Kiwanis group holding the fundraiser had a drive thru set up today for a more efficient purchasing process. They usually sell out in a couple of hours. I stopped to get a few photos and talk to the young man cooking today. He said they have about 700 chickens they are cooking today so that would be 1400 servings…I forgot to ask how many potatoes. 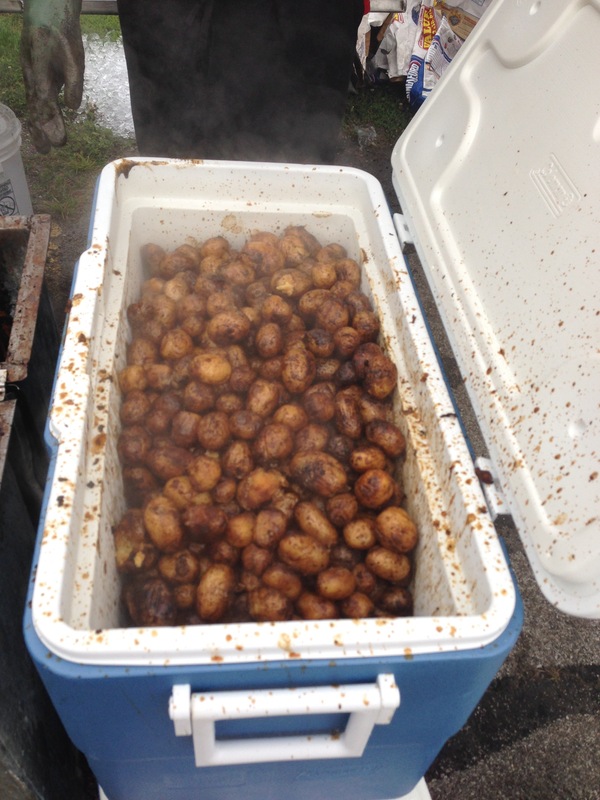 They roast the potatoes and put them in large coolers to keep them warm as they are being served. They season them with the same thing they use in the chicken. I was able to get a quick glance inside the roaster. I had the feeling I wasn’t suppose to stare too long… Or many be he didn’t want the heat to get out. They bring a Port-A-Pit@ and set up on site. They do fundraisers all over the state of Indiana and Michigan. I know that when I see someone having a fundraiser in my town I always maker sure to pick some up. I did a little research on Nelsons. They are based out of Wakarusa Indiana. They have been in business 45 years. Nelson Gonwer is the originator of chicken recipe. He was working in a poultry processing plant at the time and often entertained guests. This is when he perfected his seasoning and cooking process. Tad Nelson Gongwer is the grandson and current owner since 1997. The chicken is very juicy and the flavoring is something I can’t quite describe. 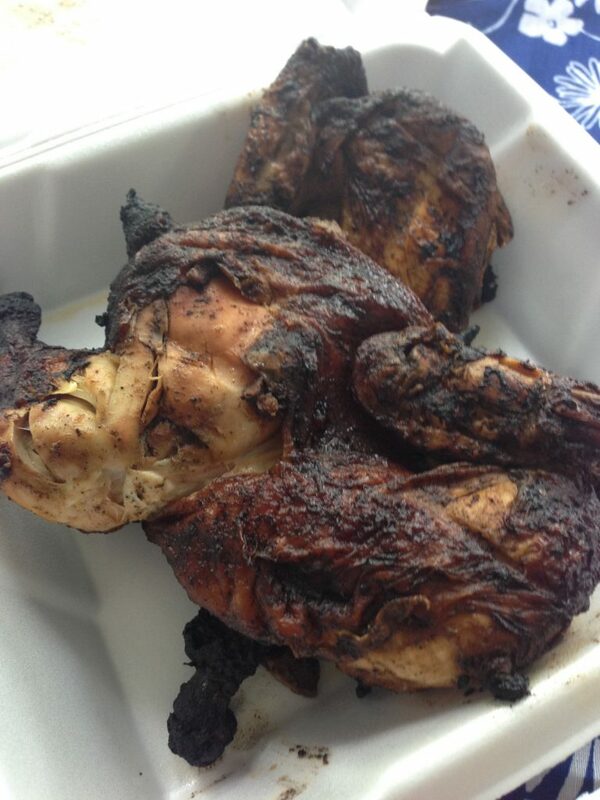 My friend Kevin ( one of the best home cooks I know ) says it reminds him of beer can chicken. I’m not sure I agree. The chicken is not heavily coated. I think they dip it in a brine before cooking. I can’t quite figure it out. The cook today didn’t say. He only said it’s a family recipe. He explained that ” the guy that owns it now is third generation and a friend of his and he was helping him out today” I checked the calendar on their website and there were a total of 8 fundraisers today selling the chicken. He was the only one at this site. The website explains that the cooking process they perfected can feed 7500 people using only 3 to cook the meat. I didn’t realize they did a full service cater option as well. They can provide, for example beef, lasagna and a hot roast with all the sides. 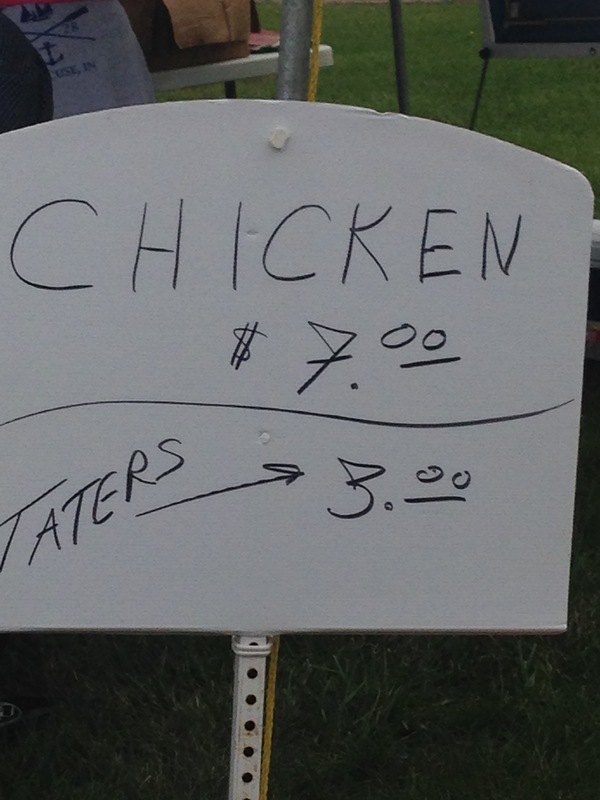 I’m curious what the hog roast is like… The roasted chicken is an art form so I bet the pork is amazing. They opened on this day at 10:30 a.m. we ordered ours at 11:00 a.m. And they sold out at 12:40 p.m. 1400 portions….think about that! Anyway, I had to share, this was our first lunch at the lake and I’m pretty delighted. 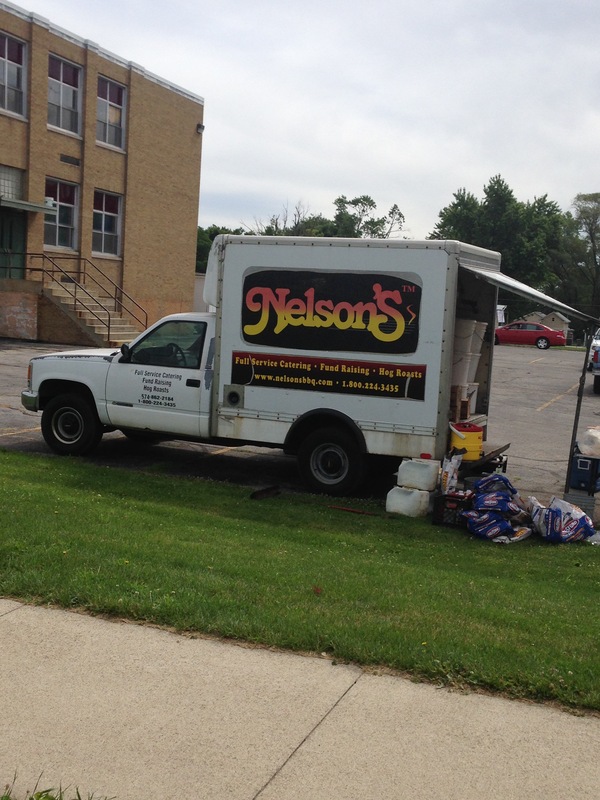 I grew up in Elkhart County and still look for Nelson’s whenever I’m home. The combination of tender, juicy and smoky is out of this world. I’ve never had better chicken anywhere. I have tried to replicate it on the BBQ–in fact I tried last night, which is how I ended up here–but so far I haven’t quite succeeded.